With its powerful and personal story, Thank You For The Rain (87 min, 2017) helps students around the world better understand the issue of climate change and climate justice. Meet key curriculum targets while using the award-winning film and resources to engage students in topics like sustainable development, climate change, politics and human rights. 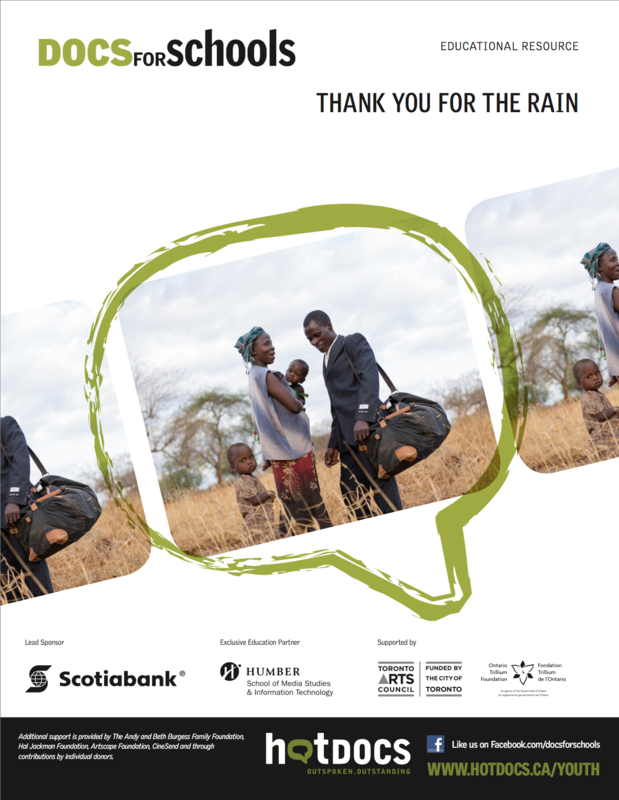 Thank You For The Rain addresses a range of issues linked to climate change, including climate justice, urbanization, gender equality, education, access to water, climate refugees, and adaptation. Dig deeper with one our free lesson plans customised to curriculum in the UK, US, Canada, Norway and Kenya. All together the resources cover more than ten school subjects suitable for both middle and high school. Download the resources and add a film screening license below. Free educational resources for high school by HotDocs. Covering curriculum in English, media, politics, equity studies, economy, geography and science. Doc Academy is a non-profit platform bringing award-winning documentary films to US classrooms. All resources are written and approved by teachers. Educational toolkits by Doc Academy and Docubox to be announced. The film has already been screened to more than 10.000 students in Kenya. Free educational toolkit for English Language (KS4 and KS3) and Geography (KS3 and KS5) by Doc Academy. Doc Academy is a non-profit platform already used by 1400 schools in the UK. All resources are written and approved by teachers. The toolkit includes 10 free clips from the film - you can choose to add a full film screening. Free educational toolkits at our Norwegian schools page. Choose between three different toolkits for middle and high school by FN-sambandet, Raftostiftelsen and Spire. Free educational toolkit by BAOBAB. From 14 years and older. Covering topics like climate change, international relations and civil society. Host a school screening of Thank You For The Rain by purchasing a screening licence (200€) through the link below - we will send you a digital version of the film. If you have any questions or want to see the film beforehand, please contact us. You can also add a personal and unique Q&A with the filmmaker or Kisilu himself - over Skype or in person! Contact us to inquire.